This craggy chunk of ochre-colored Wingate sandstone known as "The Castle" is the iconic feature of Capitol Reef National Park. It is easily accessible along the main highway through the park and very close to the visitor center. This is the south face but an easy trail of about 1.2 miles leads visitors around to the much more rugged north face covered with needles and fins and where there is a hidden canyon full of massive boulders and violet colored hoodoos. This image is a double exposure of about six hours during the night to record the star trails and 1/250 second after sunrise to record the foreground. As a natural feature of the earth, this "castle" is so magnificent that it inspired a poem which is included in my book "Visual Verse." 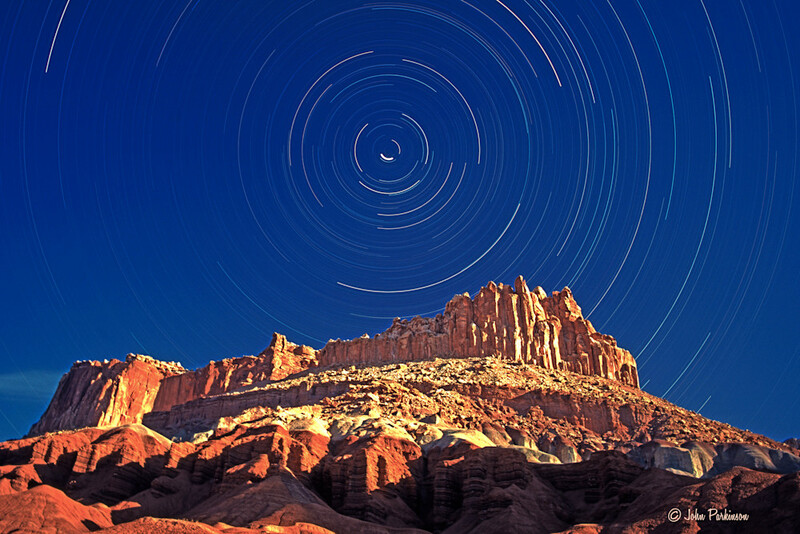 The Castle, a prominent feature of Capitol Reef National Park in Utah as illuminated by the moon at night during a six-hour time exposure to record star trails.